2 Beds 2 Baths 1,232 Sq. ft. Beautifully Updated 2 bed - 2 bath Condo in Heritage Cove, one of the area's best 55+ communities. Come step inside...you're greeted with a great view of the light, bright open concept of this Brookside Model...and a beautiful view over looking a large lake full of wildlife. The kitchen has beautifully upgraded granite counters and opens to the living room, lanai and breakfast room if you are into friendly gatherings or quiet moments. Rooms are large...the master bath has a filtered shower head and upgraded shower door. Large tile throughout with carpet in the bedrooms. Spacious tiled, glassed and screened lanai for quiet evenings, opening to the lake and walking paths surrounding the lake. Being pet friendly...you will love the convenience of this first floor home. It features a very active, social community environment...with tennis, bocce, shuffleboard, bingo, dances, golf league, entertainment, library, cards, billiards, exercise rooms, and much more. 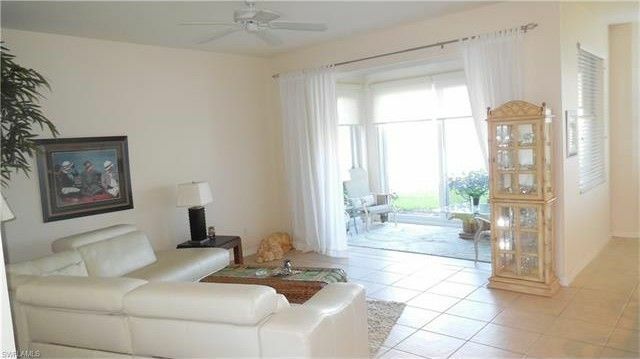 Location is convenient to everything, beaches, Fort Myers Riverfront, shopping, restaurants, and RSW airport. A big plus is an on-site manager to address any needs.. This is a must see...and shows beautifully! Directions: From Cypress Lake go south on McGregor to first traffic light..A & W Bulb. .turn left and Heritage Cove is immediately on the left. Gate code entry pad is in left lane.Through gate turn right..unit is in 2nd building on the left.